Sgt. 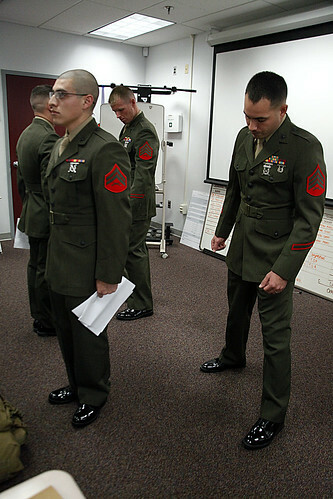 Michael A. Blaul, an instructor for Cherry Point Corporals Leadership Course, conducts a uniform inspection for Cherry Point non commissioned officers, Aug. 13. During the first week of corporals course the instructors concentrate on introducing corporals to their first Professional Military Education Course. You get a couple of classes about nutrition, physical fitness, development of the NCO mindset, said Gunnery Sgt. Valdez R. Baker Jr., staff non commissioned officer in charge for Cherry Point Corporals Leadership Course. Different things like mentorship and leadership classes that help break them in and help them understand this is your first PME and this is what to expect.